Surprisingly compact, the Series L6 Flotect Level switch is designed and built for years of trouble-free service in a wide variety of process liquid level applications. Operation is simple and dependable with no mechanical linkage as the level switch is magnetically actuated. 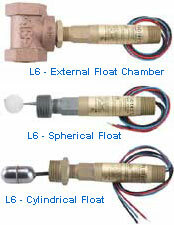 The float lever pivoted within the body moves when the process liquid displaces the float. A magnet on the opposite end of the float lever controls a second magnet on the switch actuating lever located in the switch housing.